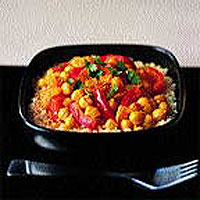 A tagine is a traditional Moroccan stew of lightly spiced chickpeas, meat or vegetables, served with couscous. Heat the oil in a large saucepan and fry the onion and pepper for 5 minutes, stirring frequently, until beginning to soften. Add the tomato and cook for 1 minute. Mix the stock cubes with 400ml boiling water and add the saffron. Add to the pan with the apricots, chickpeas and orange zest and juice. Bring to the boil and simmer gently for 10 minutes. Season to taste. Cook the couscous according to the packet instructions. Divide between shallow serving bowls, then spoon the tagine over. Scatter with the coriander and serve hot. When cooking couscous, always follow the pack instructions. Measure the liquid exactly to ensure light grains that separate easily.